Normally I avoid reading a series out of sequence, although I seem to be doing that with frustrating regularity in recent months. 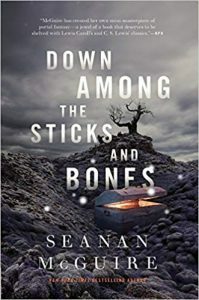 Regardless, I have done it here once again, but because Seanan McGuire is a merciful author who takes pity on the fans who adore her, she has written Down Among the Sticks and Bones in her Wayward Children series as a book that stands well on its own and does not require having read the first book for it to make sense. Twins Jacqueline and Jillian were raised to be the ideal daughters of a truly vapid couple. Jacqueline was her mother’s ideal little girl. She wore dresses, she never got dirty, and she always behaved herself. Jillian was the son her father did not have. She wore jeans, played soccer, and presented herself as a tomboy. The fact that neither of their daughters actually felt at home in her role never occurred to their parents. They wanted two perfect children, and that is what they demanded. This disconnect between who they had to be and who they actually were made them quite unhappy, and this unhappiness opened a doorway into a different world. One stormy day the girls decide to wander into their grandmother’s room. Their grandmother had lived with them when they were preschoolers, but since she did not correspond to their parents’ ideal version of a grandmother/nanny, she had been banished from the home. The girls entered the room as twelve-year-olds planning a day of dress up and play. What they found was a doorway to another place, one with monsters and myths at every turn, and there they spent the next several years. How they grew up there, how their decisions as to who they were shaped who they became, and how they eventually returned home, I will leave to the reader to discover. 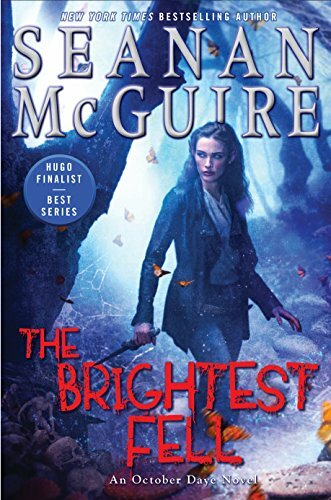 McGuire does a masterful job of revealing how each girl’s choices affect her, and her sister, and others in this new world. Not many authors can walk the line between humor and horror the way McGuire does. Even in the opening chapters when we meet the parents, page after page causes alternate wincing and chuckling. The title of the opening chapter promises this very reaction: “The Dangerous Allure of Other People’s Children.” Those of us who are parents recognize this fact. The ideas we had about parenting were shaped by our exposure to other people’s children, be they our own siblings or cousins or friends when we were children, or the children of our family members and friends when we grew up. The arrival of our own children very quickly teaches most of us an astounding fact: we knew nothing! “This, you see, is the true danger of children: they are ambushes, each and every one of them. A person may look at someone else’s child and see only the surface, the shiny shoes or the perfect curls. They do not see the tears and the tantrums, the late nights, the sleepless hours, the worry. They do not even see the love, not really…. Jacqueline and Jillian–Jack and Jill as they are known in the other world–start life being molded into their parents’ ideal children. Breaking into a new world lets them break out of that mold. Since they had no model for a different life, though, the choices they make have unintended consequences that they are not prepared to face. And when they return to the world that gave them birth, they are not recognizably the same girls. Down Among the Sticks and Bones is the second book of the series. Ideally, start with Every Heart a Doorway. Beneath the Sugar Sky came out in January, 2018, and In An Absent Dream will arrive in January, 2019. If the other books are as good as this one…well, what am I saying. This is Seanan McGuire, winner of Hugo and Locus and multiple other awards, writer of October Daye and Incryptid series and Spider-Gwen comics and (under the pen name of Mira Grant) the Newsflesh series. She is amazing; she rewards all of her readers with humor and insight and fun and fear all rolled together. The other books will be good. Read them, read this one, and cringe-laugh-cry your way through some amazing stories. Nancy is new to Eleanor West’s school. Her parents heard this was the perfect place, maybe the only place, that could help her. Eleanor West’s Home for Wayward Children took children like Nancy, helped children like Nancy, children who had disappeared from this world then reappeared with strange, unbelievable stories of other worlds, of places they went to where they felt at home and were understood and belonged. Ms. West listened to the concerns of these parents and grandparents and loved ones and assured them. We’ve had great success with such children, she said. We know you want your happy and well-adjusted child back to normal, she told them. We can help, she said. It was all a lie. But parents and grandparents and loved ones needed to hear the lie, believe the lie, believe that their child who returned in the flesh would one day return to her or his “right” mind. So they dropped off their Kades or their Jills or their Christophers or their Nancys and drove home, looking forward to the day when their child would forget all that nonsense and truly come home. Ms. West, though, knew the truth. The children she kept were not delusional. They had traveled to other worlds. They had found home, their true home, and then somehow were wrenched from that true home for their hearts and returned to a world where they did not, could not, never would fit in. The only help she could give them was to help them come to terms with their situation. Perhaps they could go back to those other worlds someday. Most couldn’t. Until they could, or until they were ready to deal with this world, they had a home with Ms. West. Their parents could not, would not, understand or accept the truth. Few ever would, or could. But Ms. West could and did. For she had also traveled, she also knew there was a world that fit her perfectly, and until she could return to that world permanently she would do everything she could to provide at least one safe, true place for other travelers to stay. 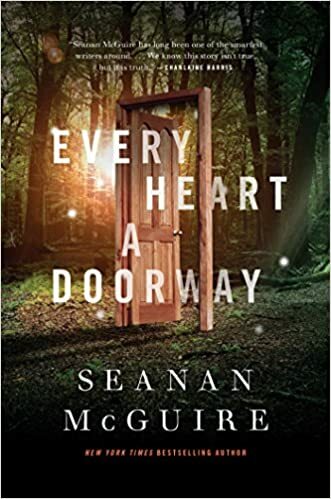 Seanan McGuire’s Every Heart a Doorway has won an amazing number of awards, probably because it recognizes the longing in so many hearts for a place to belong. The old Christian song, “This world is not my home, I’m just a-passin’ through,” expresses an ache felt by many hearts in and out of churches. There has got to be more, there has got to be a place. Somewhere, someone understands ME, knows exactly who I am, sees me, the real me. In a world full of differences, full of people who march to their own tunes, we still live lives of “quiet desperation,” alone and aware that we are alone. We meet and mingle and mate and still fail to truly connect with others. And we hope, though hope dims a bit each year, that somewhere we will stumble through a door into a world where we actually fit in. Soon after Nancy arrives, her roommate is found dead, hands removed at the wrist. More murders ensue, each grisly and each with very specific body parts removed. Some of the removals were done post mortem, but others were done while the victim was still alive, adding to the horror of the act. And as the bodies mount, so do the questions. Who? Why? Who would be next? And not incidentally, how could this place of haven survive becoming a serial killer’s hunting ground? Every Heart a Doorway is not a long book, but it is deep. For anyone who sometimes (or usually) feels lost in this world, this is a book that says, “You are not alone.” That may be the most powerful gift any book can give. Rose Marshall wants to avoid being killed. Again. She was killed once already, in 1952, run off of Sparrow Hill Road in Michigan, and since has wandered the roads as a “hitcher,” a ghost who hitchhikes along the roads trying to save people. But the man who killed her, Bobby Cross, wants her soul, and he is still chasing her. Dying once stunk, but being killed again would really ruin her day. Rose is known by many names. The “girl in the diner.” “The girl in the green dress.” “The phantom prom date.” And there are many legends surrounding her. It is said that she saves drivers by leading them to avoid accidents. It is said that she kills drivers by leading them to accidents. Rescuer? Harbinger of doom? Killer? Give a ghost a break! The rules of the road for hitchers are important. If a hitcher is given a coat, jacket, or some other outerwear, she can regain corporeal form until midnight that day. If food or drink is given to the hitcher, she can enjoy it. Rose is particularly fond of cheeseburgers and malted milkshakes. However, if the road compels her to go somewhere to try to help someone, she must obey. Sometimes she is able to save them–help them avoid an accident, send them along a different route, distract them until the danger has passed. Sometimes she is able to save their spirits, guiding them to their final destination, helping them avoid Bobby Cross and other dangers in the spirit world. The rumors of her harming people are untrue, but she does have the habit of being there at the end for a lot of people. That’s one way rumors can start. Seanan McGuire books are very personal to me. She, along with a few other authors, wrote some wonderful books that meant a lot to me in a very difficult time. Although Sparrow Hill Road is from 2014, it is new to me…and yet in many ways it is not new. It is vintage McGuire. Humor and horror mixed together. Wry, ironic, dry, yet with compassion and tenderness. McGuire loves her characters, even when she kills them. She even loves the dead ones. McGuire can make you laugh while you still have tears in your eyes from the previous paragraph. Her writing is fun and funny. And sometimes furious. And sometimes shocking. And always, always, delightful. Sparrow Hill Road is more a series of connected short stories than a novel with a single overarching plot. It jumps back and forth in time, telling stories of Rose’s dealings with humans in the daylight and with spirits in the twilight. We read of Rose’s last days alive, how she meets friends Tommy and Emma, various battles with Bobby Cross, and the fates of her niece and her boyfriend (the boy who was supposed to take her to prom on the night she died). These stories are not in chronological order; ghosts don’t quite do linear time the way the living do. 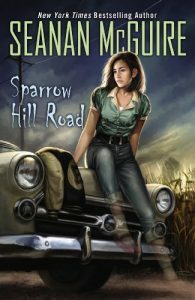 Sparrow Hill Road is set along the American highway system, which may make it exotic to readers from other countries–and makes it a quintessentially American ghost story to those of us who grew up taking our family vacations and conducting business by way of these routes connecting the continent. Although we seldom see hitchhikers on those highways today, it is fun to think that some of them may be looking for a ride, a jacket, and a burger. That is NOT a recommendation to pick one up, though. Unless she is wearing a green prom dress from the 1950s, it is not worth taking that chance. October Daye is part human and part fae. A “changeling,” she constantly lives with one foot in the mortal world and one foot in the fae kingdoms. After years of trying to balance between these worlds, she finally sees hope. Her love, Tybalt, King of the Cats, plans to marry her. Her friends are near and safe. She even gets to attend her own bachelorette party. Everything looks amazing, until her oldest and possibly deadliest enemy resurfaces: her mother. The request itself is not unusual for a private detective: find a missing daughter. But August has been missing for more than 100 years. And Amandine does not simply ask. She demands. And to make sure October follows through, Amandine kidnaps Tybalt and Jazz, another friend of October. What follows is a dangerous journey through fae and mortal lands looking for someone who may not be alive, relying on an old enemy to provide assistance, and facing challenges that force October to confront questions about who and what she is, and just where she belongs. Seanan McGuire is one of the hottest writers in science fiction and fantasy. She is a 2018 Hugo finalist for another series she writes, Incryptid. She also writes under the name of Mira Grant, and has had multiple works nominated for the major awards in science fiction and fantasy under that name as well. She won the John W. Campbell award for best new author in 2010, won both the Hugo and Nebula awards in 2013 for her novella Every Heart a Doorway, and also in 2013 became the first person ever to appear 5 times on the same Hugo ballot. Despite her amazing output–or maybe because of it–her writing is crisp, exciting, and full of characters that are deep and surprising. McGuire’s characters leap fully-formed off the page. They are passionate, infuriating, terrifying, tender, brave and cowardly. They are gay and lesbian and straight. They are human and inhuman. They are like anyone you might meet and unlike anyone you will ever know. October Daye is probably her best known character at this point, and in every book she grows and matures and becomes something new and something more. Some writers might lose their edge after 11 books. If possible, McGuire seems to be just hitting her stride. McGuire’s plots also challenge. No one escapes a Seanan McGuire novel unharmed–especially her protagonists. She demands a lot from her characters, and she is not afraid to kill even major characters to tell the story. (Fortunately, she usually doesn’t kill all of them. Well, except in Rolling in the Deep. Spoiler alert: it gets ugly.) The Brightest Fell has sacrifice and redemption, and in a major twist on an ageless theme, in this case one precludes the other. Normally sacrifice consecrates redemption. Seanan McGuire just doesn’t do normal. You might be able to jump into the series with The Brightest Fell. McGuire is able to backfill the story without getting pedantic. But you will be rewarded by going back to the beginning and catching up. October Daye grows as a character throughout the series. And it is fair to say that Seanan McGuire grows as a writer through the series. Reading as a character matures and as a writer hones her craft can be a very rewarding experience, and the October Daye series is a delightful way to watch both happen.